Looking over the hydrangea hedge and across the large front yard. 1st FL queen BR's sliders to the rear deck. A peek of the O/S. 2nd FL queen BR with a full wall of windows - child fenced! A look inside the oversized artisan O/S w/2 rainheads. Heaven! The left side of the wraparound deck, toward the artisan O/S. 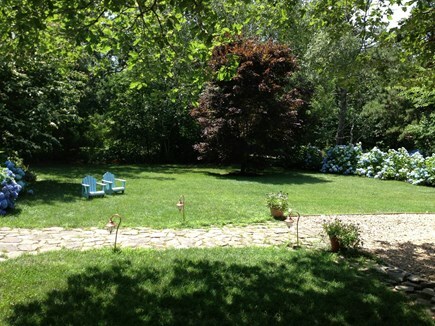 Across the front yard - perfect for a game of catch or tag! 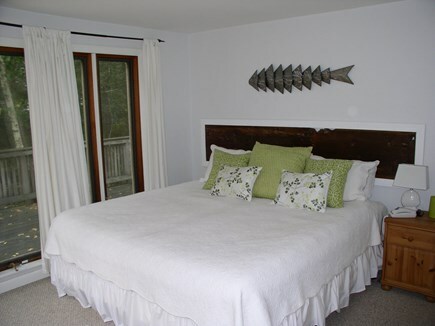 ''The Deckhouse'' You will love your vacation stay at this meticulously maintained and continuously upgraded property! This ample 4 BR home boasts several upgrades including central A/C, a large HDTV, cascading deck flower boxes, and flowering garden beds. There is a half-wall separating the living room and kitchen/DR area immediately presenting a spacious and open feeling from the entry door all the way to the kitchen's sliders leading to the wide deck's outside dining table. 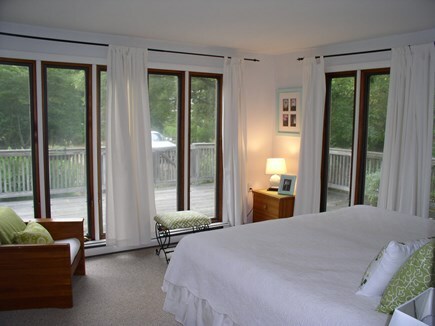 With fully screened floor-to-ceiling windows on 2 walls in both the 1st floor living room and the king bedroom and the new queen bedroom slider to the wraparound deck the sun-filled rooms invite the outside in. 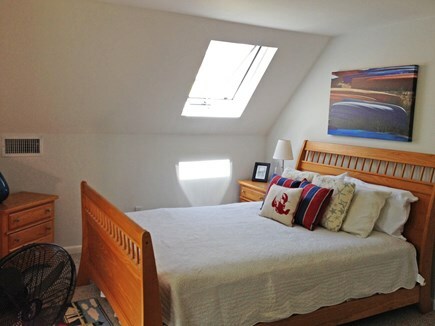 There are two 2nd floor bedrooms: one is an oversized bedroom with a double and 2 twins and desk area and the other is the 2nd queen bedroom, both bedrooms boast oversized windows as well as a skylight. 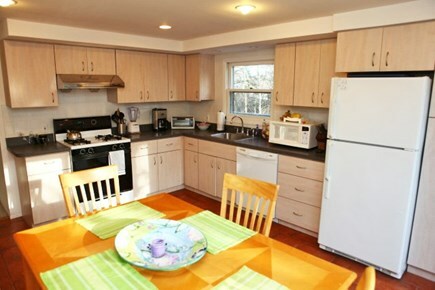 There is wireless internet throughout the house and a 46'' HDTV with cable. Enjoy the new outside lounging and dining furniture and the enclosed outdoor shower with its 2 rainheads, swirled glass window and cascading flowers. Grilling on the large gas grill is a true summertime pleasure! From the rear deck and the dining/grilling side deck, you will be overlooking the grassy backyard with its tree-slung hammock and an additional wooden stand hammock as well as a shaded area with a garden glider for daydreaming and sharing. Additional pricing info: $250. cleaning fee. 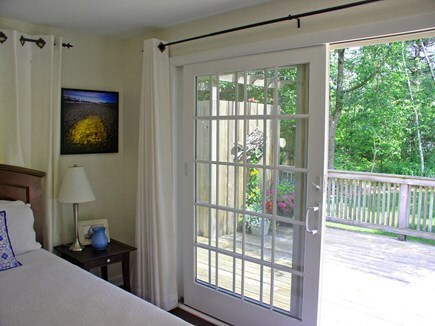 As West Tisbury has NO town lodging tax, only the 5.7% state tax is applicable, State and local taxes of 5.7% will apply. We loved staying at the deck house. 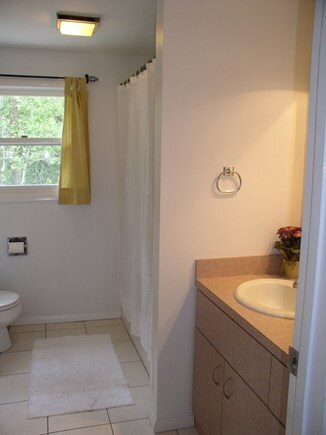 The location gives you privacy and such a beautiful setting. It was very comfortable, spacious, and well equipped. The outdoor shower was amazing. No one took a shower inside! We loved the location. It was close to the bike path and one of our favorite beaches -- Lamberts Cove. I would highly recommend renting this lovely home. The owners were very kind. Second vacation with my children and grandchildren at the Deckhouse. Absolutely love this place ... it is like a second home. And, even if there was nothing on the lot but the hammocks hanging in the beautiful yard and the outdoor shower (to die for!) I would still rent this place. 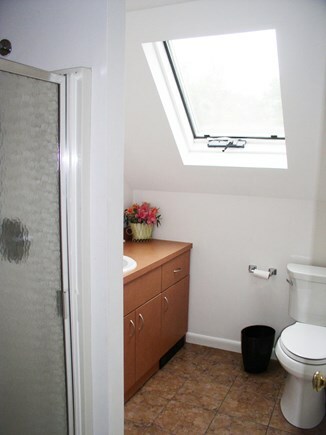 Convenient location and private. Great space for children. 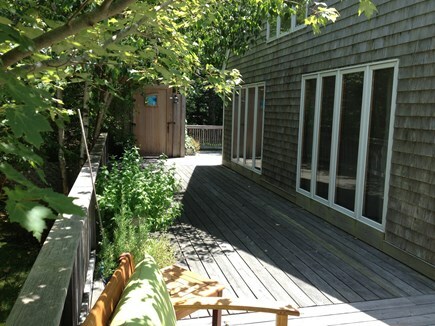 The Deck House is a winner -- plain and simple. My family and I have spent one week per summer on the Vineyard for the past decade. 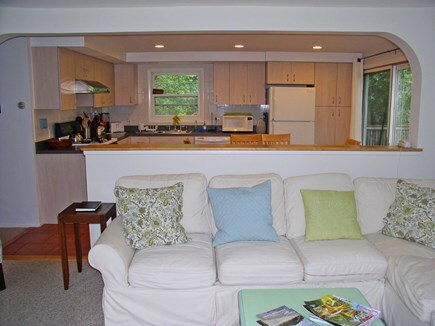 We have stayed in lots of nice homes, but we have never rented the same one twice. I just might be ready to commit to a long-term relationship after a week at the Deck House. We stayed there during the last week of August 2017, when the weather on the Vineyard is great, and the crowds have thinned just a bit. 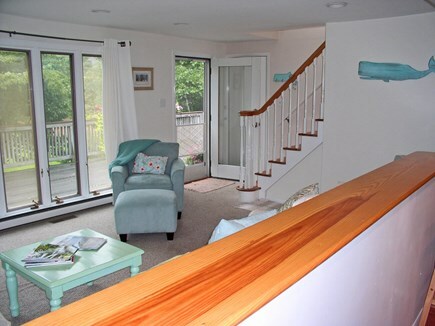 We found the Deck House to be very clean, well-appointed and conveniently located. The neighborhood is peaceful; it has dirt roads, but there are no scary potholes. 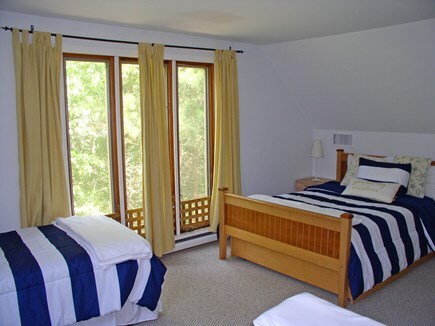 The house has the interior amenities that many vacationers look for: king-sized bed in the master bedroom (linens included for the king), central A/C, good wifi, a big smart TV, comfortable living room furniture, newer washer and dryer, and a well-equipped kitchen. 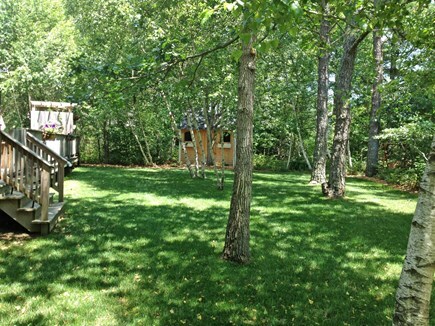 It also has fantastic outdoor amenities, including a phenomenal outdoor shower (big enough for the whole family, though that would be weird), 360-degree deck with plenty of seating, a large newer gas grill, two hammocks, a swing nestled among the trees, and attractive landscaping. 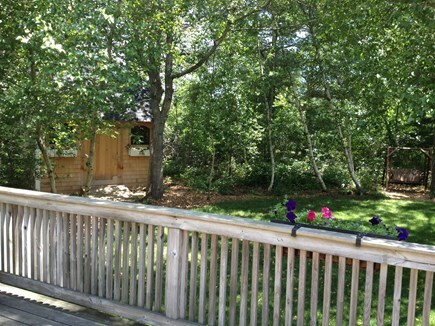 The deckhouse was the perfect place for our annual MV vacation with friends and family. 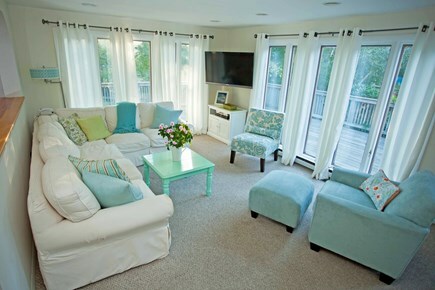 The home has plenty of space to spread out and relax. The wrap around deck is perfect for reading, relaxing, and dining. The kids enjoyed the yard space and quiet street. The ability to spend time at MV's best beach (Lambert's Cove) put the cherry on top. Thank you so much! For two glorious weeks in July my family and friends enjoyed the peaceful retreat of the Deckhouse and all of its delightful amenities! We particularly enjoyed the spacious wrap-around deck which provided us both sun and shade, morning coffee/breakfast, evening meals of fresh fish on the grill, lobster dinners, corn hole tournaments, quiet reading and conversation on the comfy deck furniture, evening cocktails under the stars and solar lighting, summer flowers blooming everywhere, generous seating, child’s table/chairs/umbrella, and a lovely manicured lawn with two hammocks and bountiful hydrangeas! The highlight was the amazing private outdoor shower complete with two rainfall shower heads, bench and flower tendrils poking through the slats! Luxurious after a hot day at the beach! Now to the inside…. very clean, ample room for eight adults and a three year old, comfy beds, two full indoor bathrooms with showers, kitchen with large table and seating for six or more, all the kitchen utensils you would ever need, large comfy sectional sofa, cable TV and excellent internet access, cheerful and tasteful décor, sunlit rooms, air-conditioning, and a large washer and dryer (and outdoor clothesline). Also available for use were beach chairs and beach towels! 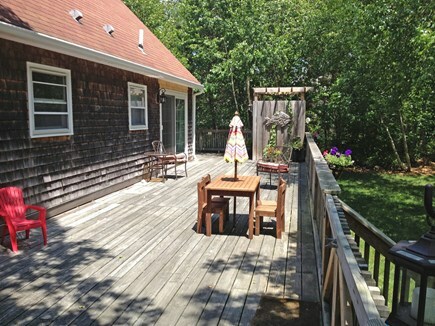 The house location is only fifteen minutes from Edgartown, OB, and Vineyard Haven and most of the beaches. Moshup Beach and Menemsha are up island but so worth the beautiful drive! Be sure to visit the Artisans Fair and Farmer’s Market in West Tisbury, Chilmark Pottery, Rainy Day, LeRoux, Morning Glory Farm and Bunch of Grapes . Check out a Vineyard Sound concert. Our favorite restaurants are the Red Cat, Beach Restaurant, Larsen’s Fish Market, Chesca’s, The Port Hunter, Nancy’s, The Bite, State Road restaurant, The Dunes, Lookout Tavern, Artcliff, and The Black Dog for breakfast. The Deckhouse owners Don and Laura are wonderful! They welcomed us with Deckhouse t-shirts for the family! They are easy with which to communicate and work hard to make their renter’s stay a pleasant one! They returned our security deposit promptly. 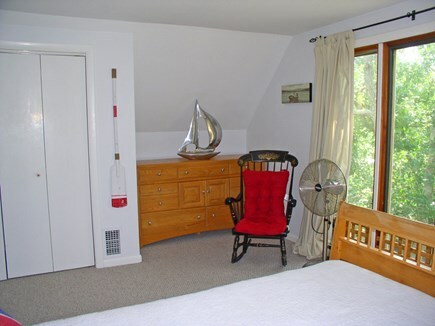 Deborah Eggars, the Deckhouse rental agent, was a pleasure to work with, communicated promptly and made the rental process go smoothly. 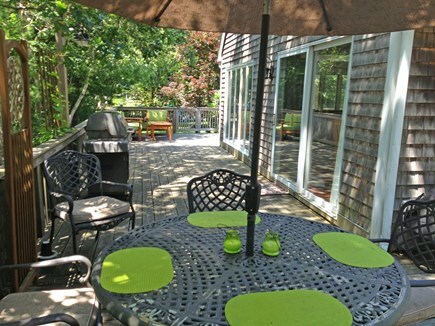 This was a great place to enjoy a vacation on the Vineyard. 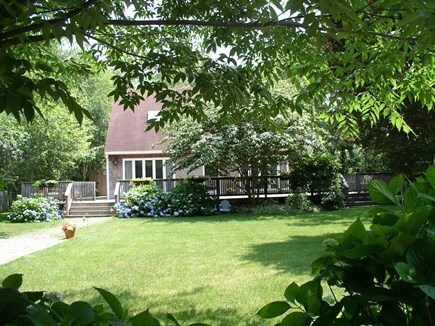 Beautiful landscaping and outdoor spaces, which made it a wonderful place to have meals on the deck, set up badminton on the lawn, nap in a hammock. Lots of open space on the first floor to enjoy on a rainy day. This is our seventh year in this home and we are looking forward to staying here again next summer. 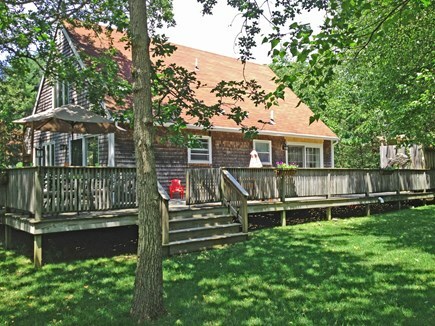 The home is quite comfortable and just a few minutes, by car, from Vineyard Haven. Air conditioning was recently put in, and though I didn't initially think it would be necessary, I must admit that it was nice to have that option on very hot and humid days. 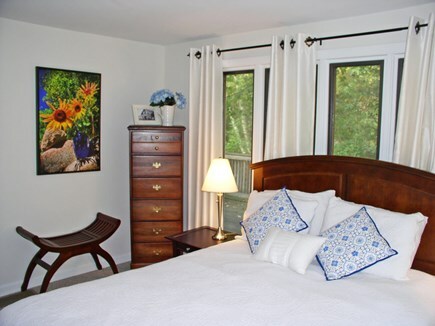 The owner has been especially solicitous by leaving gifts for guests, upon arrival, and by making himself readily available for any problems that might arise. It's a pleasure staying here and the only "down" side is having to leave! What a great place to stay! 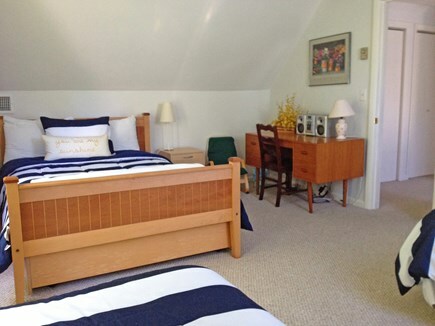 The house is clean, comfortable, and convenient. We spent 3 nights and it felt like home. Wish I could've stayed longer. 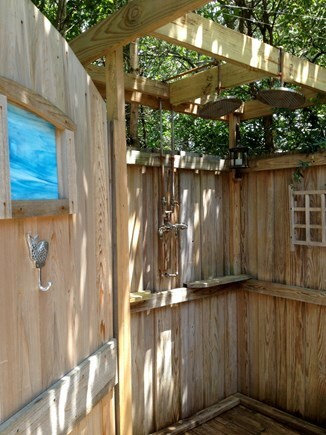 The outdoor shower is a must. 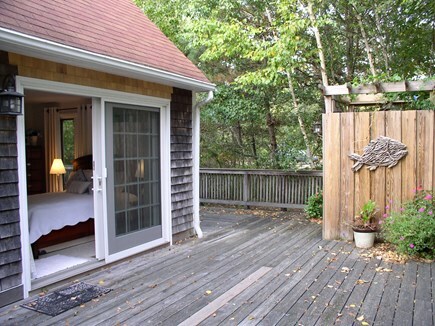 Martha's Vineyard is a great place to vacation and this is the perfect place to stay.